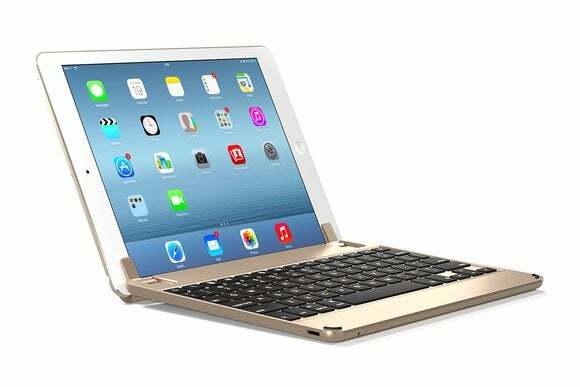 The BrydgeAir keyboard is unlike any iPad accessory I’ve used before. With integrated speakers underneath a backlit keyboard with a 180-degree hinge, it makes your iPad feel like a laptop, and that’s the entire point. 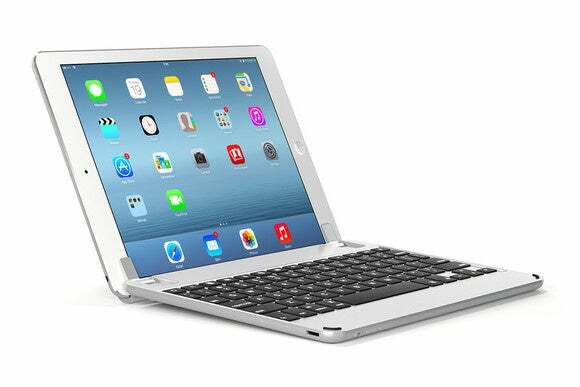 In a market of nearly identical iPad keyboards that offer the same core features, Brydge is trying to set itself apart. 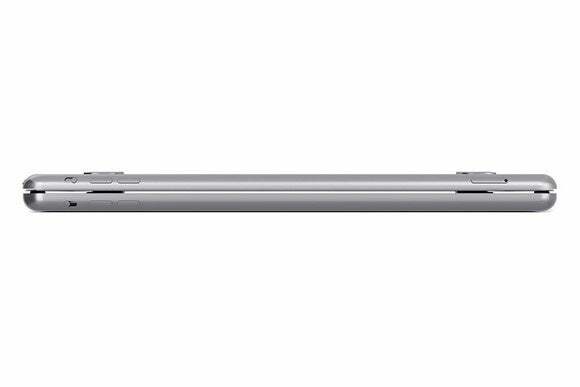 After spending the last week with its solution for the iPad Air 2, I’d say it does just that. As with nearly all iPad keyboards, the Brydge is equipped with the standard Mac keyboard layout. The keys are a bit smaller than those found on the Logitech Ultrathin Keyboard Cover, and appear to have the same amount of travel, yet offer less resistance. In my use, less resistance translated into an adjustment period of accidentally entering letters when I merely intended to rest my fingers on keys. After using the keyboard for a few hours, I was acclimated and typing relatively error free. The BrydgeAir comes in space gray, silver, and gold to match your iPad Air or Air 2, but gold is an extra $20. Along the top of the keyboard is a row of shortcut keys offering a Home button, lock key, media, brightness and volume controls. In the lower-left corner is a shortcut key to activate Siri. One of the shortcut keys activates the keyboard’s backlit keys, which is a feature I appreciate immensely. Backlit keys make it possible to use the keyboard in the dark without having to squint or move the iPad’s lit screen closer to the keyboard to find a shortcut key. I do wish there was an option to adjust the brightness of the backlit keys, instead of only an off or on option. Instead of using the go-to material of plastic for the housing, the BrydgeAir is made of aluminum. It feels solid, but the sturdy material also translates into additional weight in your backpack. The BrydgeAir weighs 1.15 pounds. In comparison the iPad Air is 0.96 pound, grams, and Logitech’s Ultrathin Keyboard Cover is 0.73 pound, about half as heavy as the BrydgeAir. For some, the additional bulk is potentially a deal breaker. Equipped with two hinges, each lined with a silicone shim, the BrydgeAir holds your iPad into place impressively well. It takes a significant amount of force to remove your iPad from the hinges. Additionally, when touching the screen there’s hardly any play, resulting in little to no bouncing of the screen compared to other keyboards. The hinges provide for multiple viewing angles, making it one of the only iPad keyboards I’ve used that has made it possible to comfortably work at a standing desk, a table, or sitting on a couch with the keyboard in my lap. The BrydgeAir has pads to keep your iPad from contacting the metal keyboard piece when it's closed, but one of ours fell off and got lost. When the BrydgeAir is closed, two small pads in the front corners of the keyboard prevent your tablet from resting on the aluminum housing. Within the first two hours of using the keyboard, one of the pads came unglued and was laying on my desk. I attempted to place it back into its channel, only to find a few hours later it had again fallen out. This time I was unable to locate it, leaving one corner of my iPad unprotected from the housing. So far I haven’t found any scratches on the face of my iPad, but over time I can see where it could become an issue. For what it’s worth, the other pad is firmly in place showing no signs of improper installation (in fact, I forcibly tried to remove it without success). When using the BrydgeAir I was surprised at how much the setup resembled the look of a smaller MacBook Air—and sounded like one too, thanks to two small Bluetooth speakers located next to the hinges on the keyboard. After the initial pairing process, you need to hold down the speaker button (located next to the power switch on the front edge of the keyboard) for a few seconds to connect to your tablet. A chime will sound to indicate that the speakers and your iPad are connected. To disconnect, the speakers, you’ll hold down the same button until another chime is heard. The ability to connect to either the keyboard or speakers—independent of one another—is a convenient way to save battery life on both devices. The speakers are just OK, but the backlit keys make the BrydgeAir easier to use in the dark. Speaking of battery life, my iPad’s battery life took a hit when using just the keyboard (beyond the normal decrease in battery when connected to an external keyboard). Usually I get roughly two days of use between charges, but during my testing of the BrydgeAir, I was charging my iPad Air 2 every night. The speakers aren’t the best I’ve ever heard, but they do offer a marked improvement over the iPad’s speakers. At a minimum, they eliminate the need to cup your hand around the speaker of your iPad when in a loud environment. 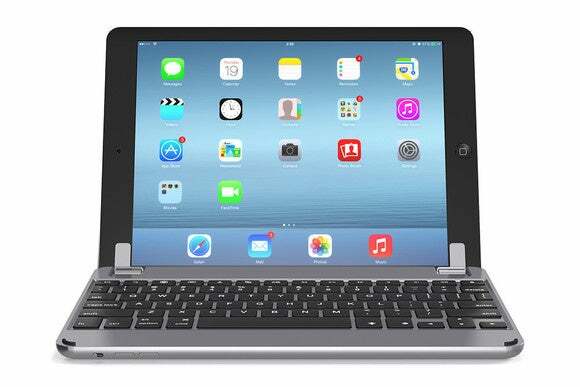 The BrydgeAir brings more functionality to the iPad than other keyboards in this category. The speakers sound OK, but not great. The backlit keys are an appreciated feature, as is the sturdy hinge and multiple viewing angles. Battery life takes a bit of a hit when you’re using both the keyboard and speakers at the same time, but that’s to be expected. For those looking to complete the look and feel converting an iPad into a mini-MacBook Air, and don’t mind the additional bulk, the BrydgeAir is worth a look. Adds more weight over a plastic keyboard case.